In France, the Galette des Rois is served on the Epiphany, the day the three kings (les rois) visited infant Jesus, on January 6th. This galette is comprised of an almond filling sandwiched by buttery pastry dough...with a feve hidden in the dough. The feve is typically a bean, but I used an almond. Sometimes, fancy little trinkets are baked into the pastry, and bakeries will compete with the feve. In French bakeries, each galette comes with a crown. Who gets to wear the crown? Whoever bites into the feve! There are two basic types of galette des rois. 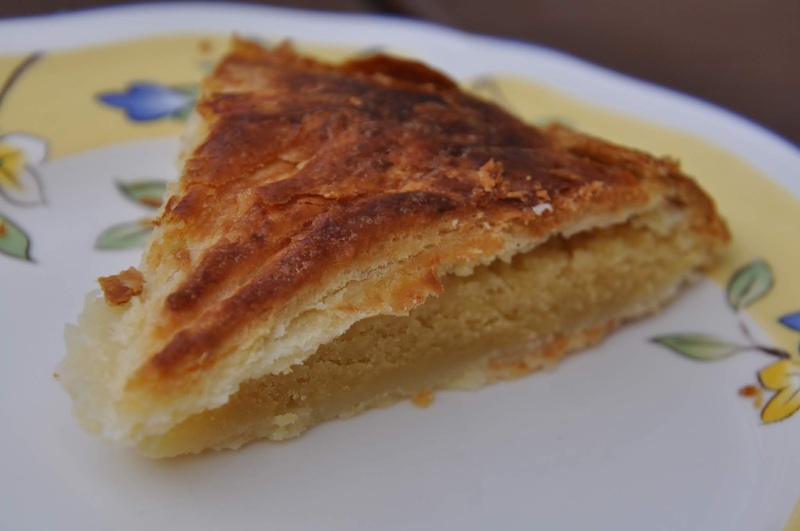 In North France, it is made of puff pastry and stuffed with a dense, creamy almond paste, known as frangipane. In South France, it is a brioche cake covered with candied fruit. In Western France, there are berry and chocolate fillings. When serving the galette, it should be divided so that each person receives a slice, along with an extra slice. The extra slice has been known as the share of a god, share of the Virgin Mary. And the share of the poor. The idea with slicing the entire pastry is to ensure that everyone has a fair shot to “tirer les rois,” or draw the kings, from the cake. The feve represents the king. Whoever discovers the feve is declared king or queen for the day and gets to wear the crown! For a French pastry, this is simple to make. Instead of making pastry dough, you could use premade puff pastry. I tried a unique pastry dough recipe from King Arthur Flour that uses sour cream. It turned out great! As I learned from pastry classes in Paris, the key to flaky pastry involves folding the dough, and this dough yielded "tres bon" flakiness. After making the dough, it needs to be refrigerated to chill. When ready to bake, you’ll make an almond filling for it. Roll the dough out, top it with the filling, add the feve of choice, and glaze the pastry, and bake! The galette des rois reminds me a little of an almond croissant: buttery flaky goodness with a not too sweet almond filling. This is a lovely pastry that is the perfect accompaniment for a morning cup of tea...or coffee ( I don't drink coffee!). Happy New Year! Here's to a sweet year ahead! To make the crust: Whisk together the flour, salt, and baking powder. Cut the butter into pats, and work it into the flour mixture until unevenly crumbly. Then, stir in the sour cream. The dough will be craggy in texture. Turn the dough out onto a well-floured surface and knead until the dough feels a little smoother. Next, pat the dough into a square and roll it into a 8" x 10" rectangle. Make sure the area is well dusted with flour that you can move it around easily. Starting with one of the shorter ends, fold the dough into thirds like a letter. Flip it over (so the open flap is on the bottom), and turn it 90°. Roll the dough into an 8" x 10" rectangle again. Fold it into thirds again. Wrap the dough in plastic, and refrigerate for at least 30 minutes (or overnight). When ready to bake, preheat the oven to 400°F. Lightly grease a baking sheet, line with a silicone liner, or line with parchment. To make the filling, combine the almond paste, butter, sugar, and salt in a mixing bowl or in the bowl of a stand mixer with the paddle attachment, until thoroughly combined. Add the egg yolks and vanilla extract, and mix until combined. Next, mix in the flours. Once combined, set aside. Next, make the glaze. Whisk the egg yolk and water together in a small bowl and set aside. Divide the pastry dough in half. Roll one half into a 10" square. Using a 10"-round template (a dinner plate or a cake pan), cut a 10" circle. Set the circle onto the prepared baking sheet. Roll the other piece of dough into an 11" square. Cut an 11" circle. Next, spread the filling over the smaller circle, leaving a 1" rim around the edge of the pastry. Place a whole almond in a random spot on top of the filling. Brush some glaze over the uncovered edge of the pastry. Then, center the larger round of dough over the filled bottom crust, and smooth it over the filling. Using a fork, press and crimp the edge of the galette to seal. Decorate the pastry by using the back of a knife to trace a pattern on the surface. Poke a vent hole in the center, and four additional small slits at other random spots, hiding the slits in the pattern you've drawn. 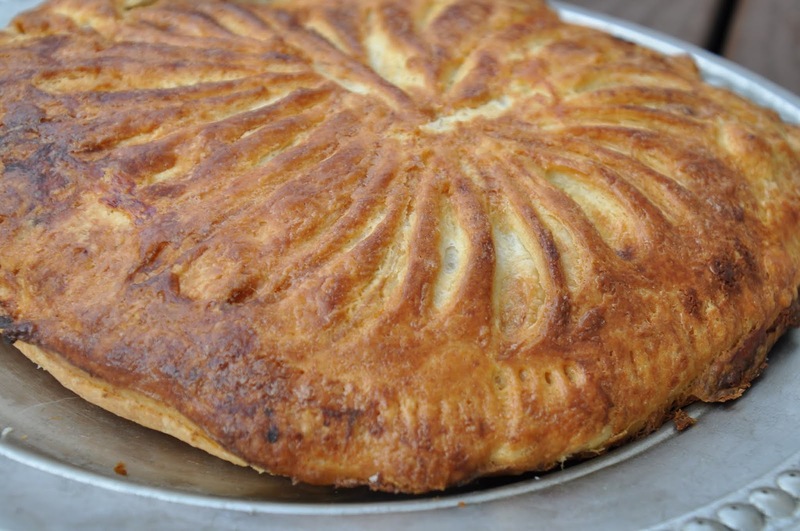 Brush an even coat of the glaze over the surface of the galette then bake it for 30 to 35 minutes, or until golden. Remove the galette from the oven, and cool it slightly right on the baking sheet. Serve galette warm or at room temperature. Pasta Aglio e Olio - the one pasta sauce that everyone should know--and keep in the back pocket for a crazy week night. My company shuts down over Christmas week and New Year's, which is great, but it means that this week is crunch time before we all turn into Christmas pumpkins on Friday. After a long work day, I wanted to cook away the craziness of the day, even though it was tempting to just pick something up. I didn't have much food--well, besides Christmas cookies--in the house (as I'm getting ready to head to California for Christmas). It has been so long since I made pasta aglio e olio, and since it requires pantry staples that I had, I was all set! 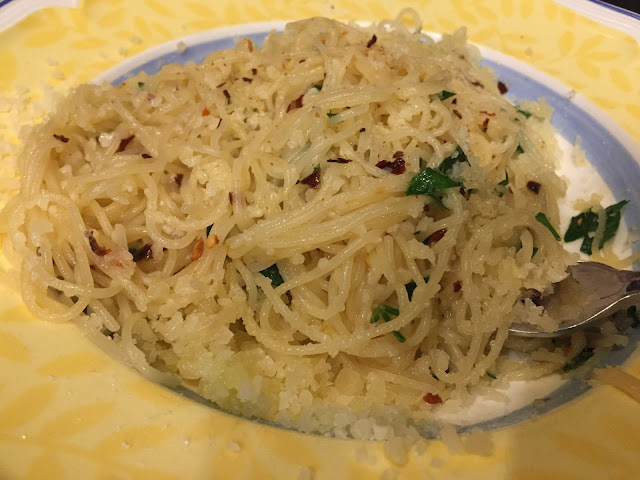 This pasta dish is simple - angel hair pasta is tossed in a light sauce of extra virgin olive oil with garlic and chili flakes. It comes together in less than a half hour. The pasta cooks while the garlic sizzles. Before the pasta becomes al dente, transfer it to the skillet with the garlic and oil Add pasta water, and cook it over medium heat, stirring and tossing quickly. This will emulsify the oil with the pasta water. If you over reduce it, and it feels too oily, add more pasta water. You'll notice below that I recommend adding only 1/4 cup of the pasta water to start. Add a salad (or not - depending on lettuce recalls), and dinner is served! Bring a large pot of water to a boil over high heat. Add the pasta and some salt, and allow the pasta to cook until just al dente. While the pasta cooks, combine the garlic, extra virgin olive oil, and red pepper flakes in a large skillet over medium-low heat. Stir until the garlic turns golden and fragrant, about 5 minutes. Drain the pasta, and reserve about 1/2 cup of the pasta water. Add the pasta and 1/4 cup of the water to the garlic skillet, and mix well. Add salt, and mix in the cheese. Serve with parsley on top. 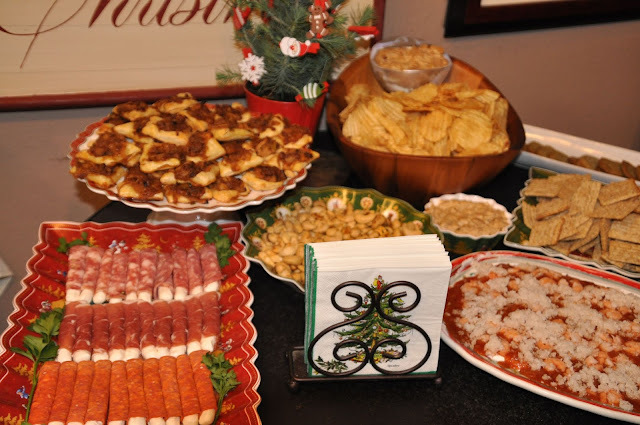 It was a fun, happy week end with my annual Christmas cookie exchange party this week end. I will have a post later this week about it. It’s hard to believe that Christmas Eve is a week away! Are you looking for a treat that will get devoured fast? 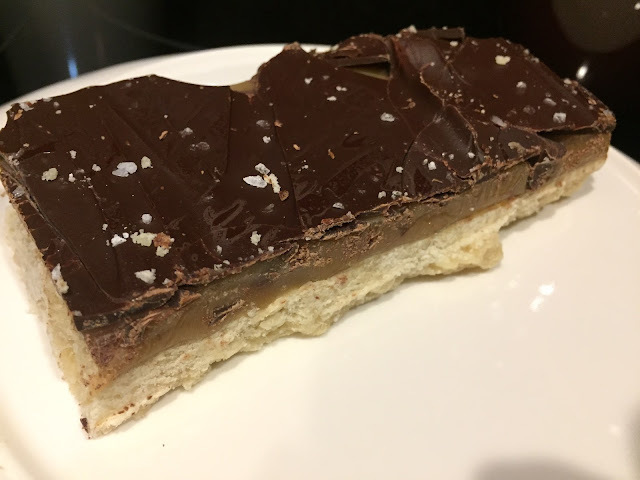 Try these millionaire’s shortbread! These are called millionaire’s shortbread because they are rich - literally. This is a cookie made of shortbread with a filling of homemade caramel and topped with chocolate. It’s like a gourmet Twix bar! For the crust: Adjust oven rack to lower-middle position and heat oven to 350°F. Make foil sling for 13 by 9-inch baking pan by folding 2 long sheets of aluminum foil; first sheet should be 13 inches wide and second sheet should be 9 inches wide. Lay sheets of foil in pan perpendicular to each other, with extra foil hanging over edges of pan. Push foil into corners and up sides of pan, smoothing foil flush to pan. Mix flour, sugar, and salt in medium bowl. Add melted butter and stir with rubber spatula until mixture is evenly moistened. Crumble dough evenly over bottom of prepared pan. Using fingertips and palm of your hand, press and smooth dough into even thickness. Using fork, pierce dough at 1-inch intervals. Bake until light golden brown and firm to touch, 25 to 30 minutes. Transfer pan to wire rack. Using a metal spatula, press on entire surface of warm crust to compress. Let crust cool until it is just warm, at least 20 minutes. For the filling: Mix all ingredients together in large saucepan. Cook over medium heat, stirring often, until mixture registers between 236 and 240°F, around 16 to 20 minutes. Pour over crust and spread to even thickness (mixture will be very hot). Let cool completely, about 1 1/2 hours. For the chocolate: Microwave chopped chocolate in bowl at 50 percent power, stirring every 15 seconds, until melted, 1 to 2 minutes. Add grated chocolate and stir until smooth, returning to microwave for no more than 5 seconds at a time to finish melting if necessary. Spread chocolate evenly over surface of filling. Sprinkle with salt, if desired. Refrigerate shortbread until chocolate is just set, about 10-15 minutes. Using foil overhang, lift shortbread out of pan and transfer to cutting board; you can discard foil. Cut shortbread into pieces. See the chip bowl and the dip with it (in the silver bowl and in the bowl in front of the chip bowl)? You NEED this dip in your life, my friends. I made this for my Christmas cookie party and had rave reviews. It is insanely good. Onions are caramelized for about an hour (if you have more time to caramelizr them, go for it!). After the onions are caramelized, you mix them into a combination of sour cream, mayonnaise, and cream cheese (AKA the trifecta for a great dip). The dip is seasoned with salt and pepper, and just a bit of cayenne. Serve this with some great chips, and you’ll be the hit of the party. The leftover dip will be perfect over a steak sandwich. After you try this dip, you’ll never want to buy a premade onion dip again. Cut the onions in half and slice them into thin 1/8 inch half rounds. In a large sauté pan, heat the butter and oil over medium heat. Add the onions and salt, and sauté for 10 minutes. Reduce the heat to medium low and continue to cook for about an hour until the onions become more brown and caramelized. Remove from heat and allow to cool. In a large bowl, add the cream cheese, sour cream, and mayonnaise, and using an electric hand mixer, beat until smooth. (Alternatively, you can use a stand mixer with the paddle attachment.) Add the onions and the seasonings. Serve at room temperature.